Do you know how to boil eggs? I bet you think you do. I thought so myself, after all even a child can do it! You put an egg in the pot of water and let it boil till cows come home. Not exactly a brain surgery. She says that's a wrong way to boil eggs. And to tell the truth, she is right, as usual. Eggs boiled that way tend to be sort of rubbery and egg yolks always have that unsightly green-colored outer ring. Take the egg out and plunge it into iced water. Or, if you can't be bothered with iced water, just dump whole bunch of ice cubes into that same pot where your eggs are lounging around. Oh, also, my Grandma taught me to put a bit of salt into the pot when you just put your eggs on the stove-top. 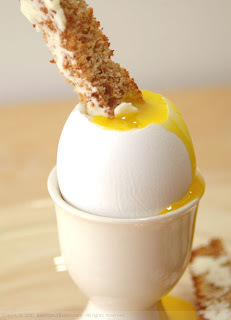 That way, if your egg cracks in the water due to high temp, it's white will coagulate and stay within the shell. And you won't end up with the ugly, runaway mess on your hand.